After a delay, Yahoo has finally launched its Flipboard competitor Livestand, bringing much of the company’s copious content to the iPad. Like Flipboard before it, the app is tailored to take the content from across Yahoo’s third-party content network to create a “visually stunning and deeply personalized digital experience tailored to each person’s interests and passions.” Livestand not only joins Flipboard in the customized, magazine-style reader space, but also AOL’s Editions, a similar app launched in the summer and closely mimicking a standard magazine. Among the app’s features are My Library (listings of topics and specific sources), Personal Mix (a magazine based on your tags), Yahoo Today (daily news exclusive to Livestand), News for You (headlines specific to your interests) and a Content Guide. 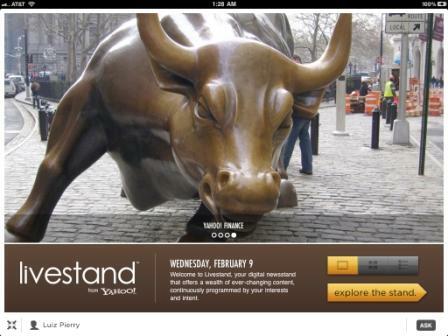 ABC News, Parenting, Forbes and Interlink Media are among the content providers contributing to Livestand.